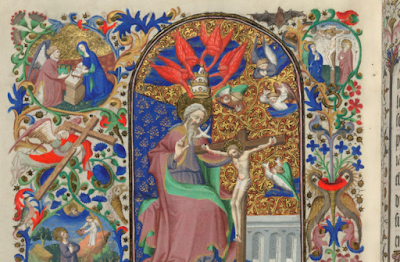 This year Good Friday falls on Lady Day, the feast of the Annunciation. 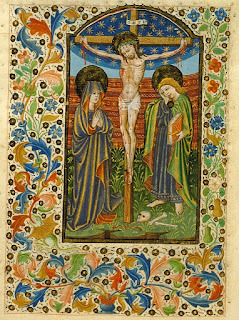 This is a rare occurrence and a special one, because it means that for once the day falls on its 'true' date: in patristic and medieval tradition, March 25 was considered to be the historical date of the Crucifixion. It happens only a handful of times in a century, and won't occur again until 2157. It is fitting that just as the Sun at that point in time first assumed power over the day, and then the Moon and stars power over the night, so now, to connote the joy of our redemption, day should first equal night in length, and then the full Moon should suffuse [the night] with light. This is for the sake of a certain symbolism, because the created Sun which lights up all the stars signifies the true and eternal light which lighteth every man that cometh into the world, while the Moon and stars, which shine, not with their own light (as they say), but with an adventitious light borrowed from the Sun, suggest the body of the Church as a whole, and each individual saint. These, capable of being illumined but not of illuminating, know how to accept the gift of heavenly grace but not how to give it. And in the celebration of the supreme solemnity, it was necessary that Christ precede the Church, which cannot shine save through Him... Observing the Paschal season is not meaningless, for it is fitting that through it the world's salvation both be symbolized and come to pass. As Bede says at the end here, this dating is symbolic but it is not only a symbol; it reveals the deep relationship between Christ's death and all the created world, including the sun and moon and everything on earth. According to some calculations 25 March was also considered to be the eighth day of the week which saw the creation of the world (for more on that, see this post), as well as the date of certain events from the Old Testament which prefigured Christ's death, including the sacrifice of Isaac and the crossing of the Red Sea. It is the single most significant date in salvation history, and for that reason has also made it into some fictional history too: those of you who are Tolkien fans will know that the final destruction of the Ring takes place on 25 March, to align Tolkien's own eucatastrophe with this most powerful of dates. 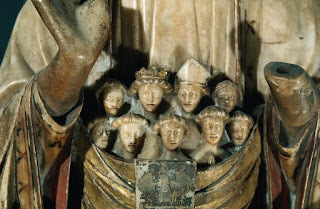 On ðone fif ond twentegðan dæg þæs monðes com Gabrihel ærest to Sancta Marian mid Godes ærende, ond on ðone dæg Sancta Maria wæs eacen geworden on Nazareth ðære ceastre þurh þæs engles word ond þurh hire earena gehyrnesse, swa þas treowa ðonne hi blostmiað þurh þæs windes blæd.... Ond ða æfter twa ond ðritegum geara ond æfter ðrym monðum wæs Crist ahangen on rode on ðone ylcan dæg. Ond sona swa he on ðære rode wæs, ða gescæfta tacnedon þæt he was soð God. Seo sunne asweartade, ond se dæg wæs on þeostre niht gecierred fram midne dæg oð non. On the twenty-fifth day of the month Gabriel first came to St Mary with God’s message, and on that day St Mary conceived in the city of Nazareth through the angel’s word and through the hearing of her ears, like trees when they blossom at the blowing of the wind... And then after thirty-two years and three months Christ was crucified on the cross on the same day. And as soon as he was on the cross, creation revealed that he was truly God: the sun grew black, and the day was turned into dark night from midday until the ninth hour. Đær hine eac ongeaton Adam ond Eua, þær hi asmorede wæron mid deopum ðeostrum. Đa ða hi gesawon his þæt beorhte leoht æfter þære langan worolde, þær Eua hine halsode for Sancta Marian mægsibbe ðæt he hire miltsade. Heo cwæþ to him: ‘Gemyne, min Drihten, þæt seo wæs ban of minum banum, ond flæsc of minum flæsce. Help min forþon.’ Đa Crist hi butu ðonan alysde ond unrim bliðes folces him beforan onsende, ða he wolde gesigefæsted eft siðian to þæm lichoman. Adam and Eve saw him there too, where they were stifled in deep darkness. When they saw his bright light, after that long age, Eve implored him there for the sake of her kinship with St Mary to have mercy on her. She said to him: ‘Remember, my Lord, that she was bone of my bones and flesh of my flesh. Help me for that reason!’ Then Christ released them both from that place and also sent a countless number of joyful people before them, when, triumphant, he set out to return to his body. 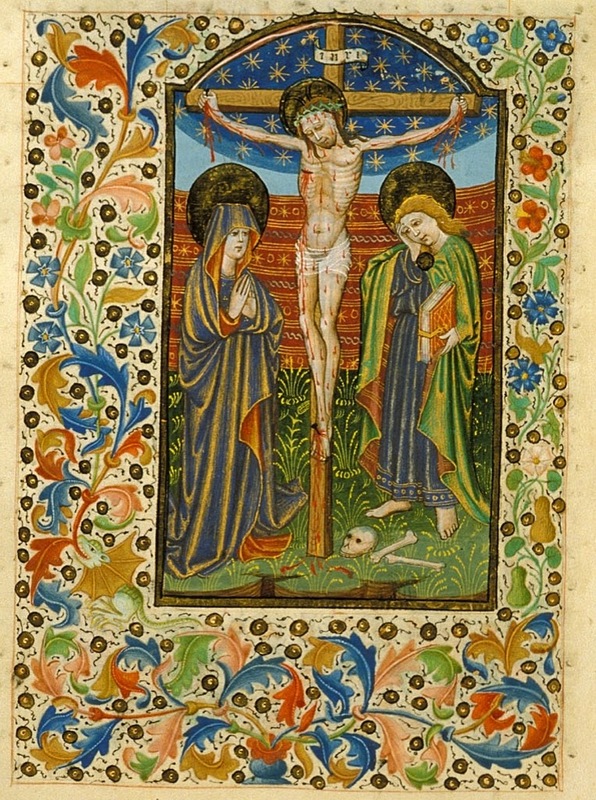 The Virgin sits under a green canopy, while Gabriel in green and red kneels facing her. The rest of this impressive ceiling, which dates from c.1390, depicts the ancestors of Christ in a form of Jesse Tree. There are more pictures here. 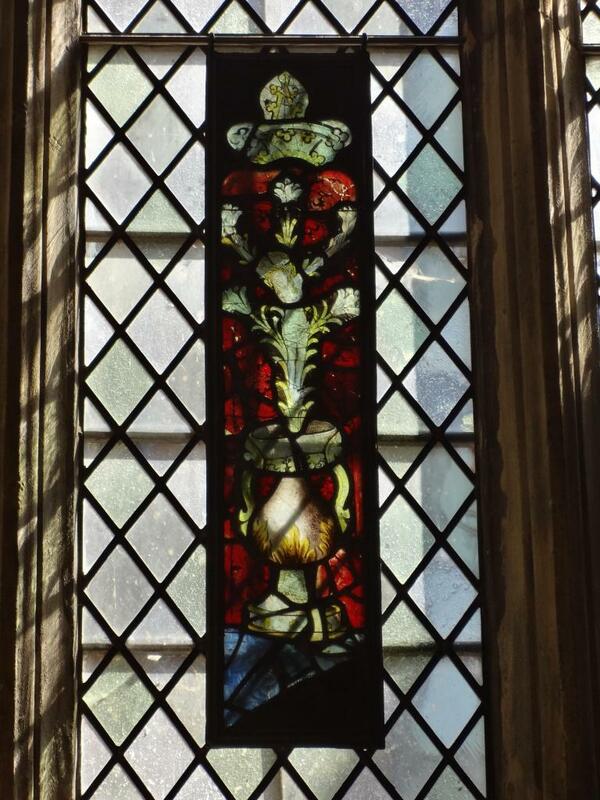 This too was originally part of an Annunciation scene, though the other panels are now lost. Click to zoom in and study the detail! 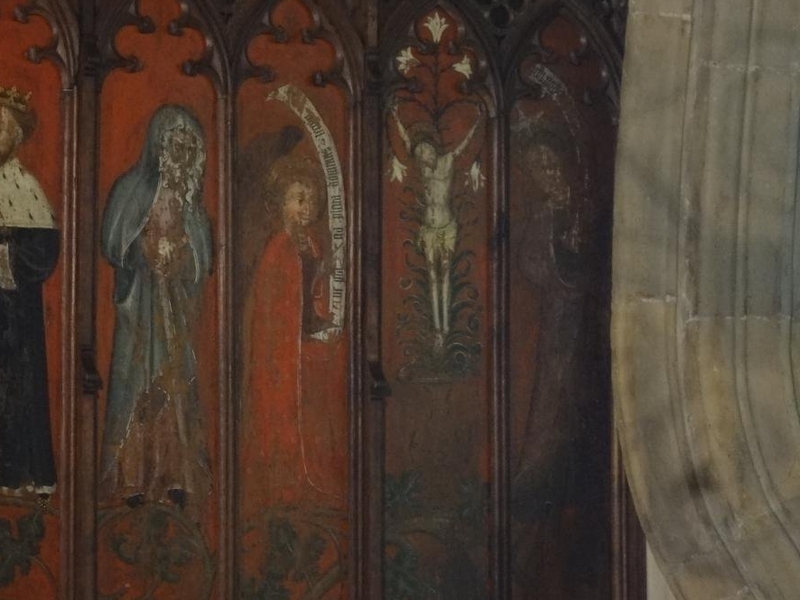 The top half of the panel is damaged, but clearly showed God the Father holding the crucified Christ, part of a common depiction of the Trinity - compare the image at the top of this post, and there are more examples collected here. Me reweth, Marie, thi sone and thee. Although so short and apparently so simple, this is full of meaningful wordplay: as the sun sets behind the wood, so Christ the Son is shrouded in darkness on the wood of the cross, the tree. Rode can mean both 'face', and rood, of course. Another good example of a text which approaches the Passion through Mary's motherhood is 'Stond wel, Moder, under rode', with its explicit appeal to a female audience and its poignant comment that by her grief Mary learns to understand 'what pain they have that children bear'. In this poem Mary's situation, though so extraordinary, gives her kinship with all women who have lost children or found in motherhood grief as well as joy. The link between the Annunciation and the Crucifixion brings together in one circle the beginning and the end of Mary's motherhood, its joy and its sorrow, as well as completing the circle of Christ's life on earth. Of the Angel’s Ave and Consummatum est. A paradoxical conjunction of feast and fast: was there ever a day more suited to metaphysical poetry? 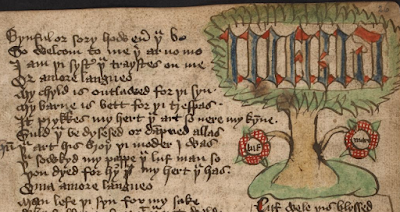 Although this wonderful poem is all so characteristically Donne, it explores many of the same parallels as the medieval texts and images we've already seen: the circle, the tree, beginnings and endings, and the two moments in the life of the Virgin, seen at once 'at almost fifty and at scarce fifteen'. The coincidence of feasts gains rather than loses from being a rare occurrence, as Donne suggests - from falling 'some times and seldom'. It is, he says, an act of wisdom in the church, existing in time, to be moveable, while God is a fixed star, eternally the same. 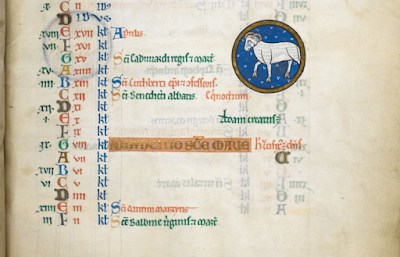 The overlapping cycles of the church's calendar offer many such conjunctions, which change every year as the fixed cycle intersects with the variable one. Although these coincidences often have their origin as much in pragmatic decisions about the calendar as in theology, with the kind of approach Donne exemplifies here they can be read in meaningful and imaginative ways. Through such eyes, a meeting of feasts like this year's is not exactly a coincidence, but perhaps one of those 'occasional mercies' of which Donne writes elsewhere: 'such mercies as a regenerate man will call mercies, though a natural man would call them accidents, or occurrences, or contingencies'. They are moments which seem to reveal a purpose behind the randomness of life, to show both natural and man-made events and seasons to be part of an ordered and carefully structured universe. It's the calendrical equivalent of a pun, like the medieval poet's 'sun under wood' or Donne's orbity - a place where meanings meet. 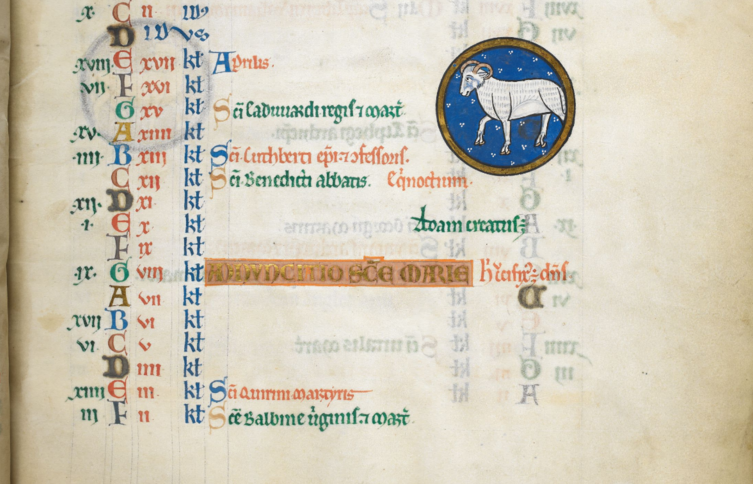 This year's conjunction is a particularly rich example, but all through the year these coincidental graces can be found, as beauty and meaning are produced by the changing juxtaposition of feasts and fasts, the fixed and the moveable seasons. Lent, Easter, Ascension Day, Whitsun - all can at various times coincide with different fixed occasions, different stages in the seasons of spring and summer, and the experience of each can accordingly change from year to year. 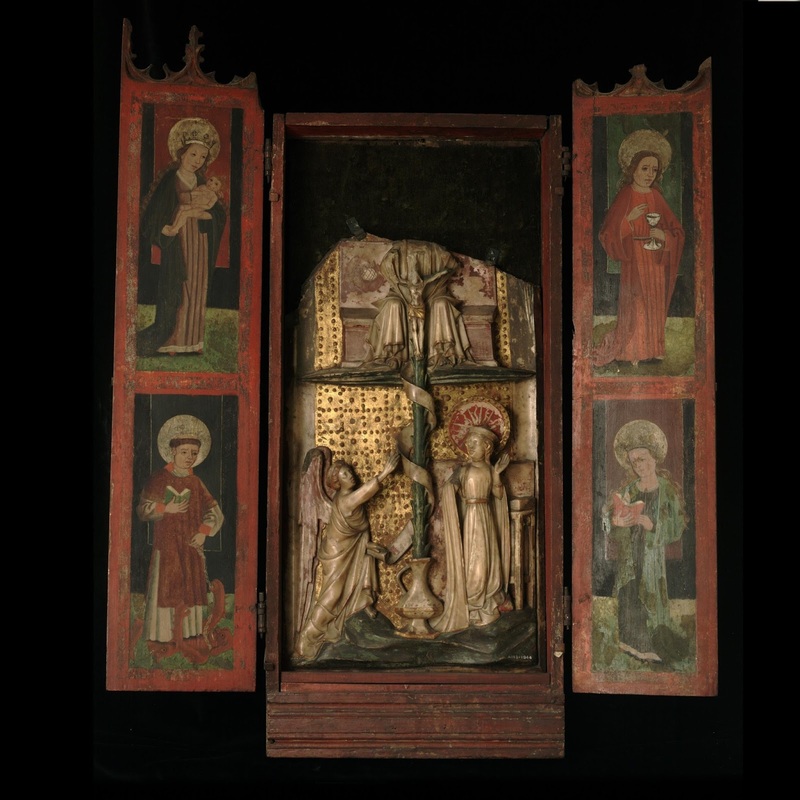 As the cycles intersect in different ways, familiar texts and images breathe new life into each other, and bring forth new and different fruit (to borrow the Old English Martyrology's metaphor for Mary's conception). In such ways the interlocking wheels of the calendar give cosmic meaning to the cycle of our own days, months, and years. Of course, a fixed date of Easter would do away with all this. As a medievalist, I found the discussion of the question of fixing a date for Easter a few months ago rather depressing. If there were any theological arguments under consideration, no one seemed to think it worthwhile to articulate them publicly; discussion focused mostly on solving the non-existent problem that some people (schools, maybe?) apparently find a movable date for Easter a bit inconvenient. I've never in my life heard anyone complain about being inconvenienced by the date of Easter, so I really struggle to imagine who considers this a pressing issue. And for that, churches would break with nearly two thousand years of tradition, a complex system worked out with great care and thought and invested over centuries with profound meaning. The fixed dates proposed for Easter are in April, so never again would Good Friday fall on the feast of the Annunciation. So much loss for so little gain! Bede truly would be spinning in his grave. 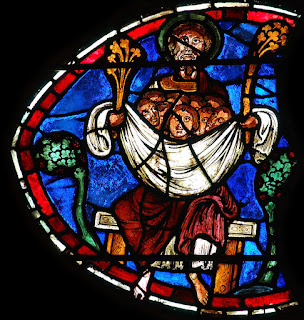 It strikes me (once again) that however much many people today, in their ignorance of all but the broadest stereotypes about the Middle Ages, stigmatise the medieval church as worldly, rigid, and oppressive, it was in some ways immeasurably more humane and creative than its modern successors. It was happy to see human life as fully part of the natural world, shaped by the cycles of the sun and moon and the seasons; it was able to articulate a belief that material considerations, convenience, and economic productivity are not the highest goods, and not the only standards by which life should be lived. 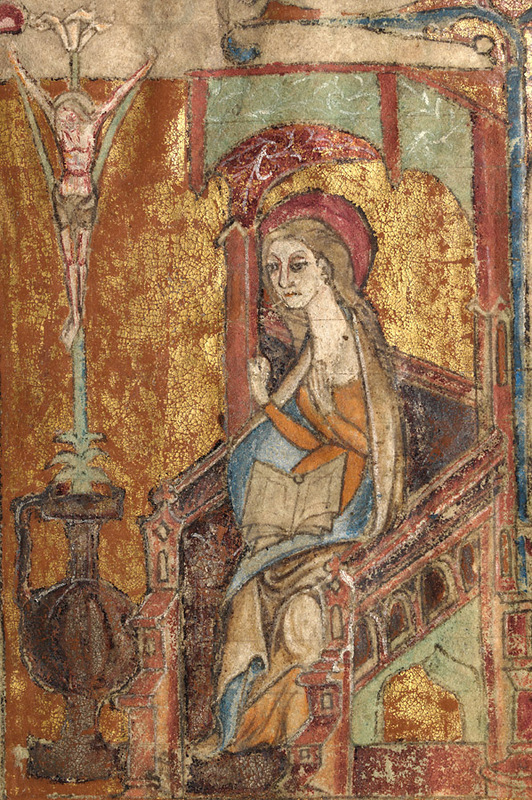 When confronted by calendar clashes with the potential to be a little awkward or inconvenient, the medieval church could have the imagination not to simply suppress them or tidy them away, but to find meaning in them - meaning which springs from deep knowledge of the images and poetry of scripture, the liturgy, and popular devotion. So enjoy the coincidence this year, this meeting of dates which has inspired preachers, poets, and artists through many centuries of Christian tradition. Unless you plan to live until 2157, you won't see another in your lifetime - and if the date of Easter is fixed, it will never happen again. 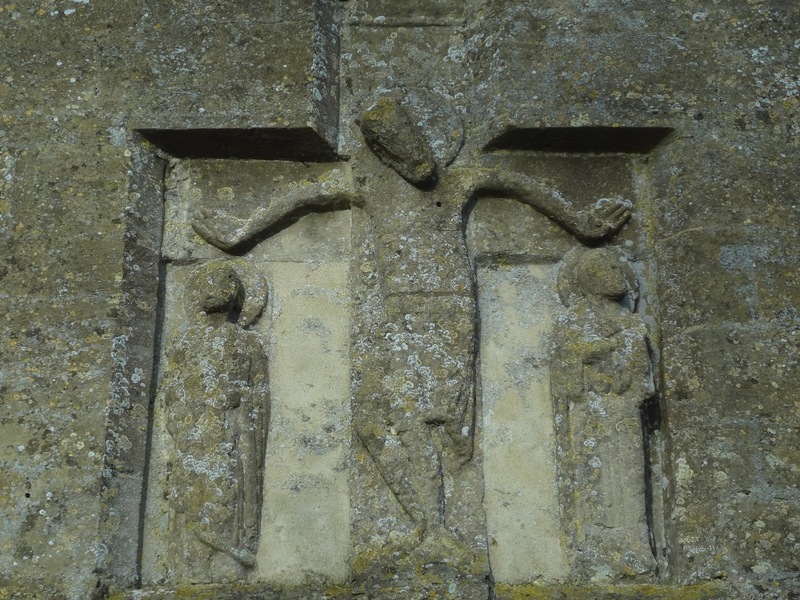 In my column for History Today this month, I've written about a church in Oxfordshire which has two incredible surviving Anglo-Saxon sculptures: two roods, one a life-size carving of Christ with outstretched arms, the other a smaller scene including Mary and John at the foot of the cross. They probably date to the tenth or eleventh century, and are a sign that the church in this quiet village must once have had some wealthy patrons. 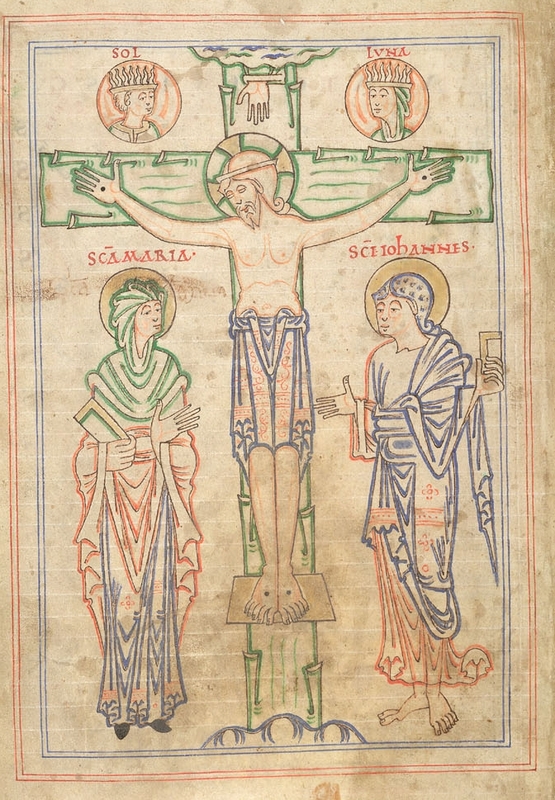 I'm fascinated by Anglo-Saxon life-size figures of Christ, such as this or the one at Romsey Abbey, and have written about them before here. They have a remarkably human presence, and the various records of how people interacted with them as if they were living creatures, and stories in which they actually come to life, make perfect sense when you are standing in front of them. The one at Langford can be seen from the road, before you even enter the churchyard; although now headless and damaged, its open-armed, welcoming embrace is strangely moving. So it's interesting to watch the various responses to the anniversary of the Norman Conquest, and it provides a useful challenge to the historian: what's the best way to talk in public about this famous story, which is not just familiar but full of popular half-remembered facts (1066 and all that!) and bound up with some very deep-seated national myths? It stirs up emotions which manifest themselves in unexpected places, and the language we use to talk about this story can be revealing. I'm often taken aback by the tendency of twentieth-century historians to talk about people like Ælfsige of Faringdon in anachronistic language as collaborators, traitors, even 'quislings', as if a generation of historians who had grown up in the years after World War II were consciously or unconsciously applying the language of Nazi occupation to eleventh-century England. (Better historians than me have written about this.) It's bizarrely emotive language - whatever you think of the Norman Conquest, the Normans were not the Nazis! Although now less common in academia, it still has quite a hold on popular history, and it can cause problems if it leads historians to talk about the aftermath of the Conquest as if there was only one right way to respond to it and anything else is a bit morally suspect. 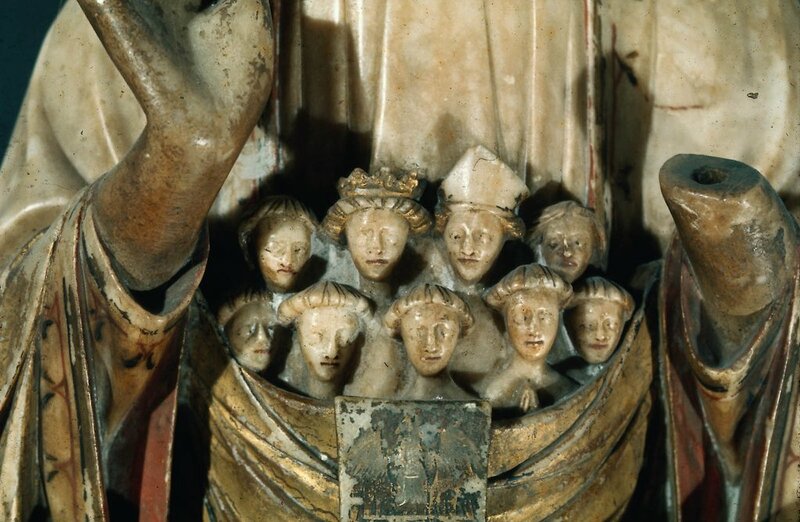 It leads to a focus on the oppression/rebellion kinds of narratives (interesting as they are), and an omission of the more complicated ones, perhaps of the people for whom violent anti-Norman rebellion was not an option - women, the young, the old, monks and nuns, and so on. There's lots of great research being done on these kinds of topics, and hopefully the anniversary will allow some of it to filter through to the public. But the use of an anniversary, a single date, has its problems too. The focus on one watershed moment, even one so undeniably dramatic and important as the Battle of Hastings, threatens to come at the expense of nuance. It's hard to simultaneously commemorate the anniversary of 1066 as a single decisive moment and to tell the longer story of what came before and after, and it can become all too easy to overlook the facts and stories which might get in the way. 'Are you Norman or Saxon?' asks this clever little English Heritage quiz, getting you to decide your allegiance on the day of battle - but of course it's not as simple as that. There are a hundred extra factors to take into account, from the other parties involved in the events of 1066 (the Norwegians, not to mention the Danes, who took an active role in the aftermath), to the fact that those who fought on the defending side at Hastings called themselves 'English', not 'Saxon' - as English as English Heritage itself. One of those annoying history-bore supposed slam-dunks, which crops up among ill-informed journalists or on Twitter with depressing regularity, is 'the Anglo-Saxons weren't even English, duh! They spoke German!' which is complete nonsense: by the time of the Norman Conquest, there's no question whatsoever that these people called themselves, and their language, 'English' (englisc). The fact that we don't often call them that says nothing about them, but a great deal about the effect the Norman Conquest had and still has on popular perceptions of history in this country, cutting off centuries of history and English literature as if they belonged to some kind of pre-history of a people who are not 'us'. The English Heritage website classifies all of Anglo-Saxon England, right up until 1066 (! ), as 'the Dark Ages', which is pretty revealing about where their sympathies lie. How can you hope to tell the story of the Norman Conquest with anything like objectivity when your unquestioned assumption is that the Normans brought 'light' into the 'dark' world of the Anglo-Saxons? Dividing history into periods is always difficult, of course, though necessary, but there's no reason to use such pejorative language when there are plenty of less loaded alternatives available. No terminology is perfect, but acknowledging that fact openly can lead to useful discussions about how historians make these kinds of decisions. When it comes to engaging with the public, I think it never hurts to remind people that this sort of periodisation is mostly a matter of convenience, and that historical periods don't map easily onto human lives. 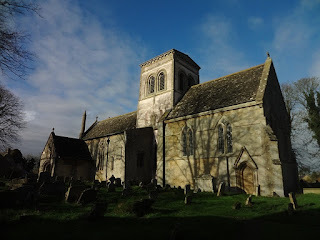 If 1065 was the 'Dark Ages', and 1067 was 'medieval', how do you talk about the people, like Ælfsige of Faringdon, who lived through the decades before and after? 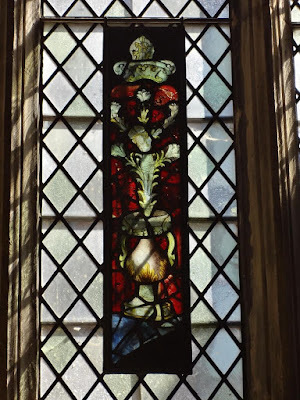 (Or, for instance, St Wulfstan of Worcester, Earl Waltheof, St Margaret of Scotland, ordinary English monks, and so on.) It's not easy to classify the identities and allegiances of these people, or to label the world(s) they lived in; nor perhaps should we wish to. It's when you get past the labels that the most interesting stories appear. To take one example: I was amused (and pleased!) to see that one of the questions in the English Heritage quiz helps you determine your allegiance by asking you to pick between pre-Conquest and post-Conquest manuscripts. The 'Saxon' images come from the New Minster Liber Vitae and the Bury Gospels, the 'Norman' ones from this Life of St Dunstan and a Passionale from St Augustine's, Canterbury. 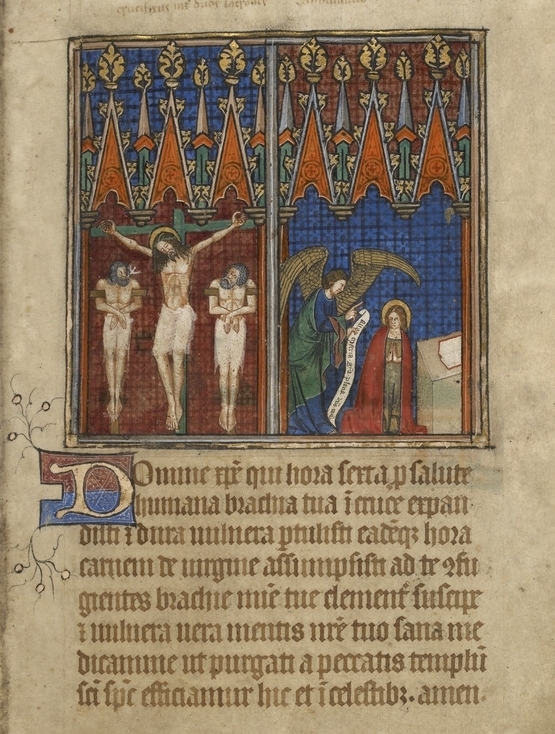 All four are beautiful manuscripts, and they make good examples of pre- and post-Conquest manuscript art from the early eleventh and early twelfth centuries. But, as it happens, they also nicely illustrate the complexity of the situation. For one thing, none of these manuscripts belong to any period anyone might reasonably call the 'Dark Ages' (just look at them!). All four are texts of Christian learning, produced in monasteries which had far more in common with each other, and with similar institutions across Europe, than with the England of the fifth century or the fifteenth. On the 'Saxon' side, the New Minster Liber Vitae is the manuscript which contains the famous image of Cnut and Emma presenting a cross to the monastery, and it dates to c.1031, when England was part of Cnut's Scandinavian empire; if there's any such thing as an Anglo-Danish rather than an Anglo-Saxon manuscript, this is surely it. But it kept being used and added to throughout the eleventh century, and for decades after the Conquest; Norman names were added alongside English and Norse ones in the lists of friends of the monastery. 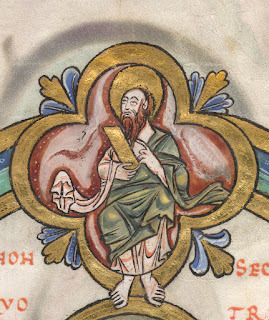 The other manuscript, the Bury Gospels, belonged to a monastery which claimed Cnut and the Danish earl Thorkell as its founders, and which was an especially cosmopolitan centre of learning, even by the standards of late Anglo-Saxon England. 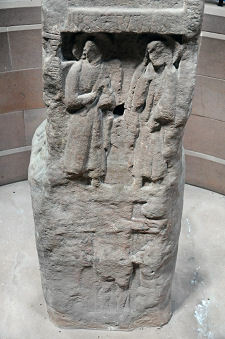 At the time of the Conquest it had a French abbot, appointed by Edward the Confessor, and he remained in his post for more than thirty years after 1066. 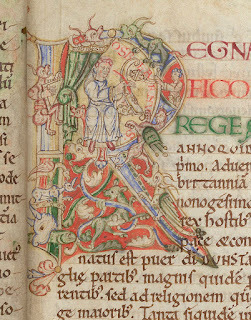 As for the 'Norman' side, one of the images chosen (above) comes from an account of the life of a pre-Conquest English saint, Dunstan, Archbishop of Canterbury. 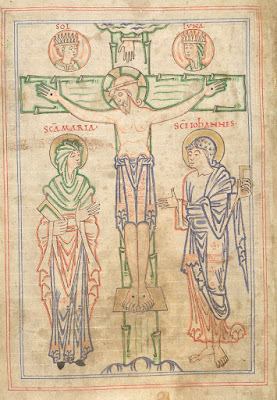 The text dates to the late eleventh century (c.1090) but is based in large part on written sources from the tenth century. 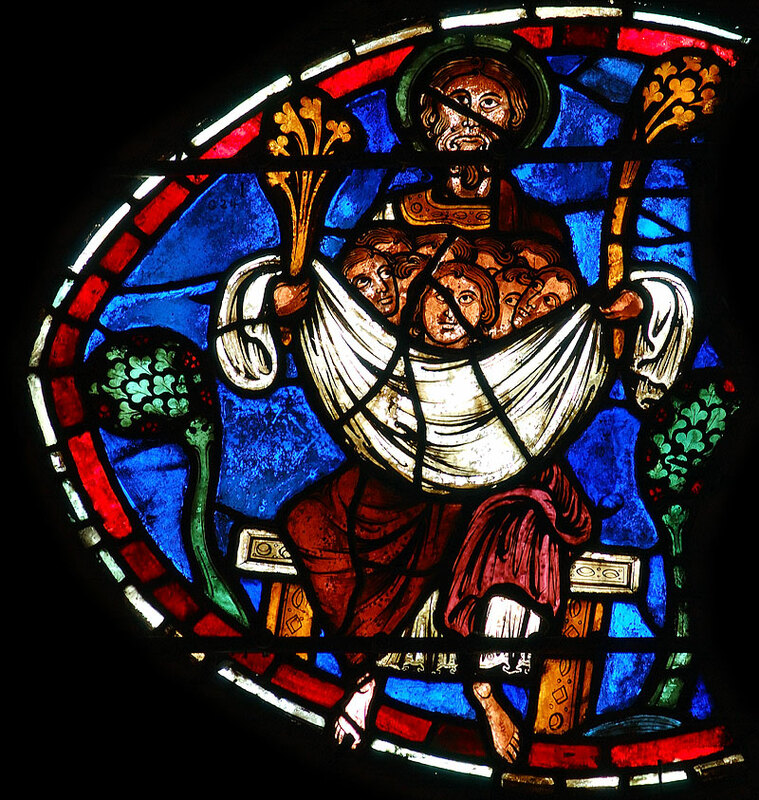 This image is of the text's author, the Canterbury monk and historian Osbern, who grew up in England before the Conquest and lived through its aftermath. Osbern later spent time in Normandy, grew close to St Anselm, dedicated some of his work to Archbishop Lanfranc, and lived in what we call 'Anglo-Norman' Canterbury. But he wrote only, and proudly, about English history, drawing on his memories of the pre-Conquest monastery as well as earlier written texts. 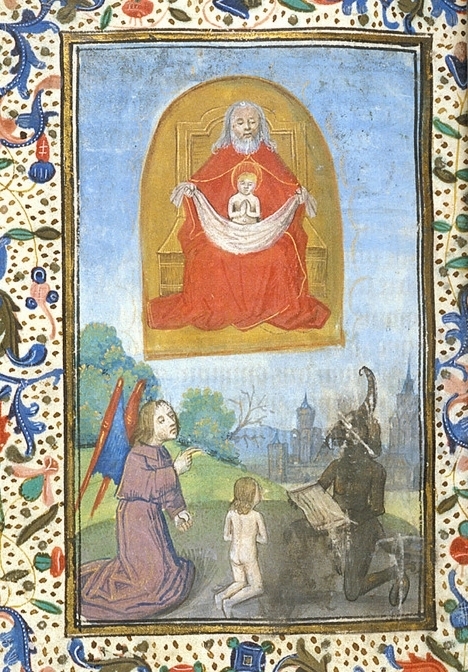 So it's an image of an Englishman, writing about an Englishman, in a manuscript made in England at the birthplace, as Osbern describes it, of English Christianity; the very letter he's sitting is in an R for Regnante magnifico Anglorum rege Æthelstano, beginning a sentence which dates the birth of Dunstan, and the reign of 'Æthelstan, glorious king of the English', by reference (in true Bedan tradition) to adventus Anglorum in Britanniam. 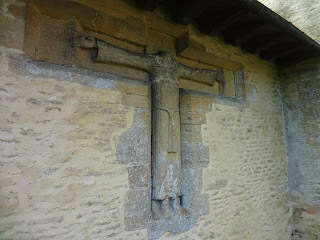 Is this a symbol of 'Norman' identity? Perhaps this all just seems like pedantic nitpicking, but I'm not actually being critical - whatever image you chose might raise the same issues, and it's the complexity of those questions which makes the situation so fascinating. (And I approach these issues as a historian of literature; an art historian, or a legal historian, or an archaeologist would take a different view of periodisation here). You can tell the story of the Norman Conquest as a tale of goodies and baddies, the triumph of sophisticated Normans over the 'Dark Ages' of the primitive Saxons - but why would you want to, unless you think the public aren't capable of understanding anything more nuanced? 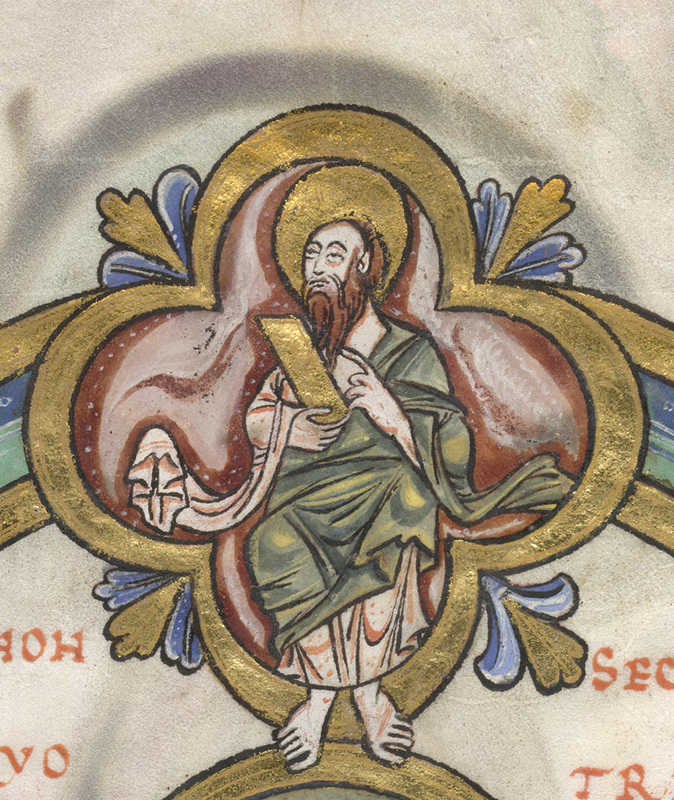 There's nothing 'dark' about late Anglo-Saxon England, even in the sense of 'unrecorded' - there are ample surviving sources of all kinds, including an extraordinarily rich and sophisticated literature in both English and Latin. (It's one of my bugbears that because most people haven't heard of any Old English texts except Beowulf, they confidently assert that 'Anglo-Saxon England didn't have much literature'. So I try to redress the balance a little here...) Attempting to understand what did and didn't change at the Norman Conquest isn't helped by promoting the idea that someone just flicked a switch one day in 1066 and turned on the lights. Anyway, there will be plenty of opportunities to think about these matters in this anniversary year. Though Langford is just a few miles from where I live, I only learned of its existence through a reader of this blog, who contacted me and invited me to go out and visit the church. It was a joy! I'll write a proper post about the church when I get a chance, but in the meantime you can read a bit more about it here. 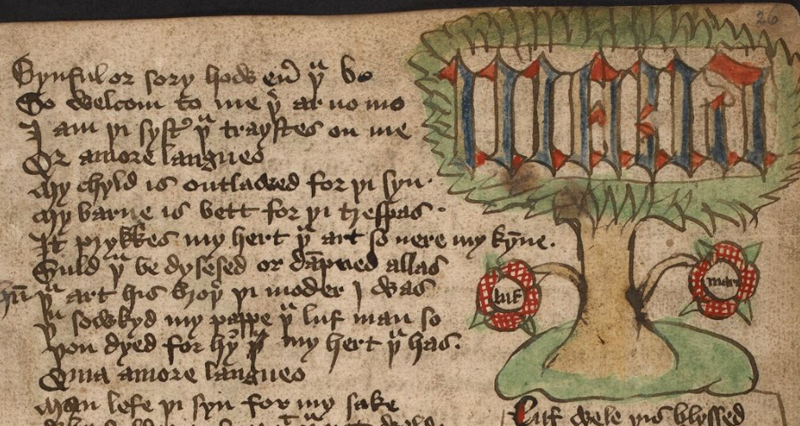 Something to read on Mid-Lent Sunday, from Piers Plowman. After Piers the Plowman - many a place I soughte. As hoor as an hawethorn, and Abraham he highte. And of whennes he were, and whider that he thoughte. And of Abrahames hous an heraud of armes. Of oon muchel and myght in mesure and in lengthe. That oon dooth, alle dooth, and ech dooth bi his one. 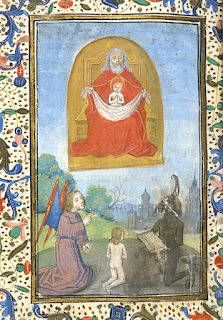 Pater is his propre name, a persone by hymselve. Wardeyn of that wit hath, was evere withouten gynnyng. Confortour of creatures--of hym cometh alle blisse. Of hymself and of his servaunt, and what suffreth hem bothe. That is, children of charite, and Holi Chirche the moder. For in his bosom he bar a thyng, and that he blissed evere. Amonges patriarkes and prophetes pleyinge togideres. "I wolde wite," quod I tho, "what is in youre lappe." "Lo!" quod he - and leet me se. "Lord, mercy!" I seide. Lollynge in my lappe, til swich a lord us fecche." I wepte for hise wordes. for Piers the Plowman; many a place I sought. white-haired as a hawthorn-tree, and Abraham was his name. and where he was from, and where he was going. a herald of arms in Abraham's household. a most bold knight - I knew him by his blazon." "What does that warrior wear," I asked, "as bliss betide you?" of one degree and power in length and in breadth. What one does, all do, and each does alone. Father is his proper name, a person in himself. guard of all who have wits, who ever was without beginning. comforter of creatures - of him comes all joy. his own and his agent's, and what sustains them both. that is, the children of charity, with Holy Church the mother. for at his bosom he bore something which he kept blessing. among patriarchs and prophets playing together. "What are you waiting for?" he asked, "and what is it you want?" "I want to know," said I, "what is in your cloak." "Look," he said, and let me see. "Lord, mercy!" I said. "That's a precious gift; for what prince is it intended?" lolling in my lap, until such a lord saved us." the might of God's mercy, which might us all amend!" I wept for his words. The souls here rest in a cloth held between the arms of God the Father, who has his hand raised in blessing. He holds the crucified Christ between his knees, with a symbol of the Holy Ghost marked above the cross. 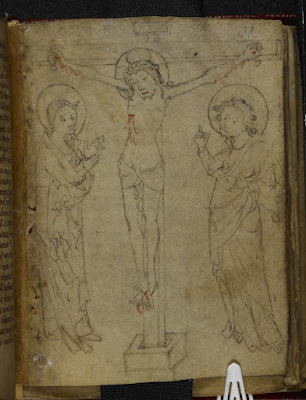 This way of depicting the Trinity, known as a 'Throne of Mercy' image, is common in medieval art, but this combination with the Bosom of Abraham is found only in English alabaster. 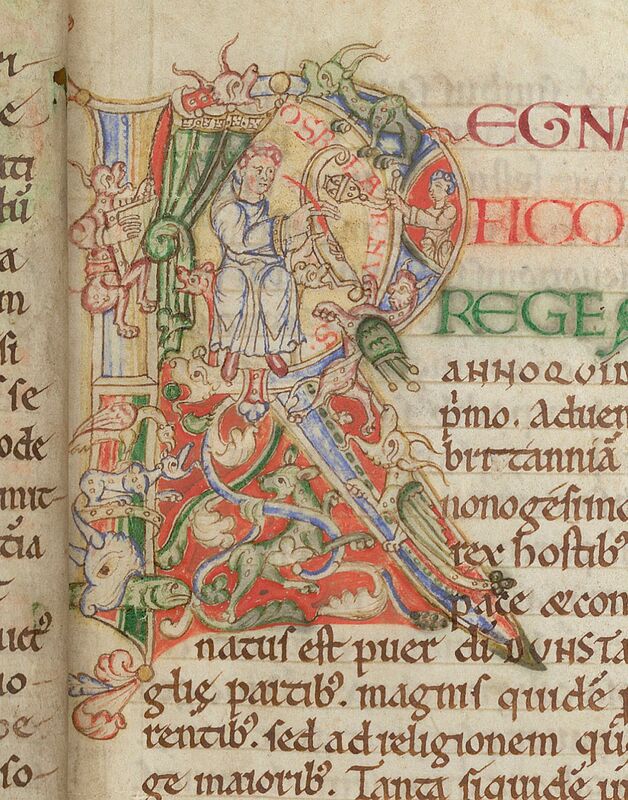 Piers Plowman brings this kind of iconography unforgettably to life, as we see the 'patriarchs and prophets playing together' in Abraham's lap. 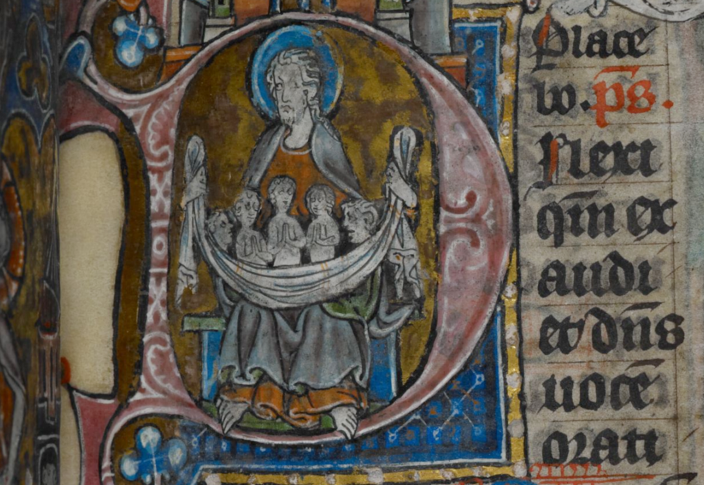 The little naked souls in these images look like children, and in the poem they are called 'the children of charity, with Holy Church the mother'. 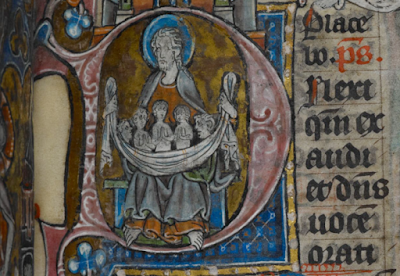 They are 'patriarchs and prophets', people of dignity, fathers and begetters - but here they are imagined as infants held against a parent's breast. 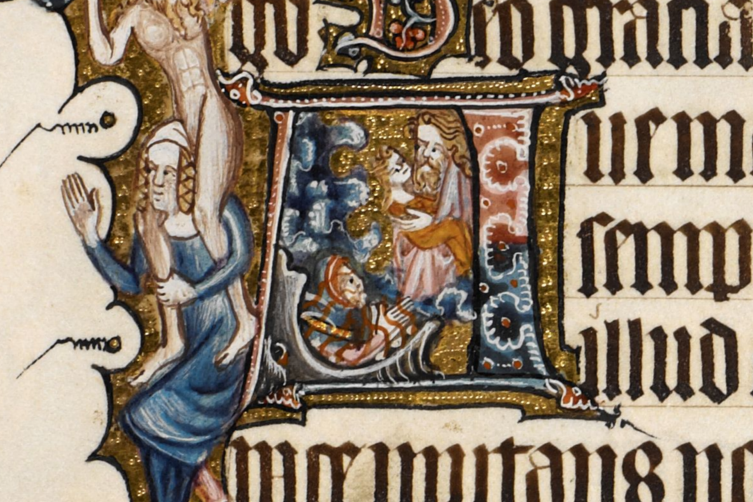 Like children they 'loll' in Abraham's lap, happy enough but helpless 'til such a lord us fetch.' 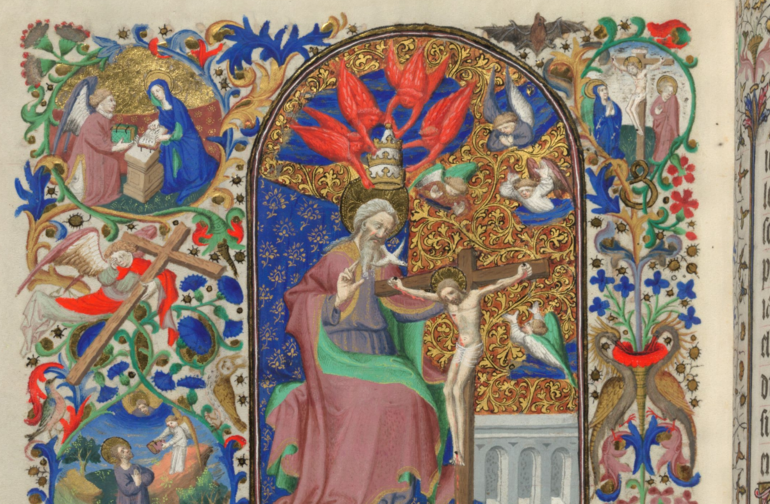 It's a tender, maternal image, fitting for this moment in the liturgical year, as the poem is starting to run towards Jerusalem to re-enact the events of the Passion. The Epistle for Mid-Lent Sunday speaks of the two children of Abraham, and of 'Jerusalem our mother'; and in part for this reason, the Fourth Sunday of Lent has traditionally been kept as Mothering Sunday in Britain. 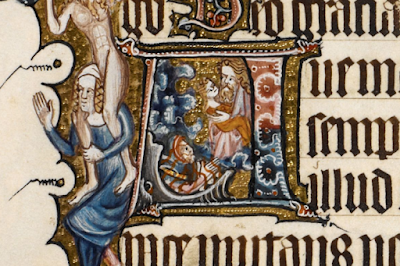 Mothering Sunday is first recorded nearly three hundred years after Piers Plowman was written, but the language here is unmistakably maternal: Abraham holds the souls against his breast and is constantly 'blissing' them, like a mother soothing and comforting her baby. There's something very poignant about Abraham's tenderness and the little creatures' vulnerability; no wonder it moves the dreamer to tears.